I love the highlands. It’s a place I keep going back to. Scotland is so beautiful, remote and has some incredible legends. I literally can not get enough. But due to my Mexico adventure, I hadn’t been to this wonderful part of the world for two whole years. This had to be fixed. So I booked my second Macbackpackers trip and had a short break up north. 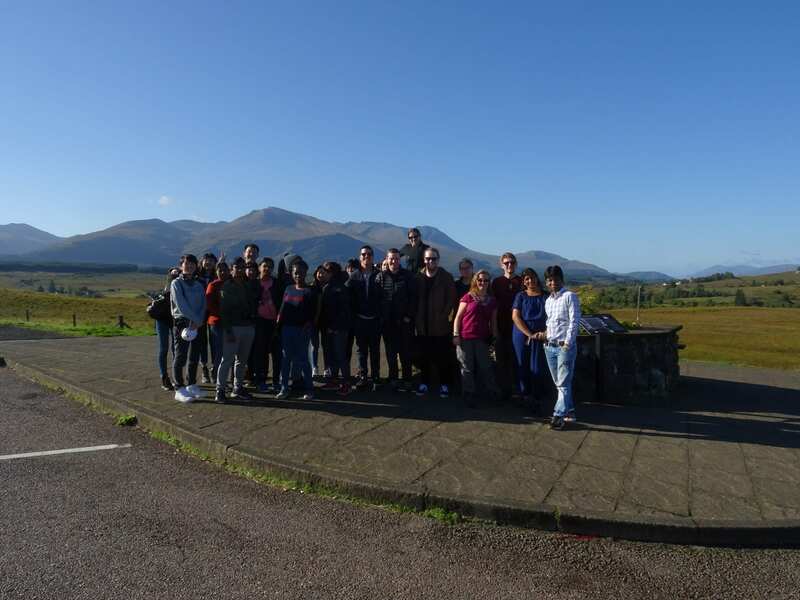 I have travelled with Macbackpackers a few years ago, and I think that’s where my love of Scotland developed. The tour was amazing, I made some friends for life and had some incredible experience. They are a budget company that only do tours in Scotland, so they really know the area and their clients. The itineraries aren’t strict either, the drivers have flexibility, which is needed to avoid Scottish weather sometimes. The guides are some of the best I have ever had too. I wanted to relive this experience. The tours always start from Edinburgh, bright and early. This time I was doing the 3 Day Loch Ness And Skye Tour. The first day was spent driving to Loch Ness, with plenty of stops along the way. Some I had visited before, others were new to me. But each stop was thoroughly enjoyed. One of my favourite stops was just outside of Callendar, here I met some new friends. We pulled up on a small car park and were introduced to Hamish and his family. Hamish is a highland cow (or Coo). With him are his missus and calf. And they are all so friendly. Well, tourist mean food, so they were happy to see us all. The shop sold bags of veg to feed Hamish and his family. And they were all very greedy. Several times I thought my hand was going down a cow’s throat. 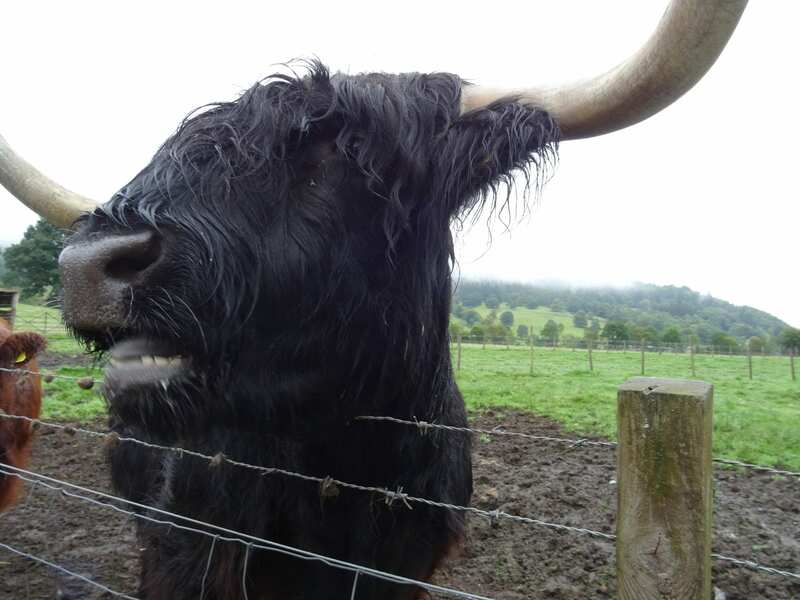 As soon as our time was up and we started heading to the bus, Hamish mooed his disappointment. We stopped at what might be my favourite place in Scotland, and possibly the world, Glencoe. This was my third time visiting this valley, but I would happily go back again and explore it more. I don’t know what draws me to this place. It is beautiful, eerie and has a very bloody history. This valley was the site of the Glencoe Massacre. The Campbells murdered many of the MacDonald Clan whilst they were being hosted here. After a day of exploring we stopped at our Macbackpackers hostel for the night, Lochside Hostel. And Lochside is definitely the word. I have never stayed in a hostel with such an incredible view. Right over the shores of Loch Ness. It even had its own private beach. Albeit, there’s nothing around the hostel. You have to bring your own food to cook and any other supplies. But the kitchen facilities are the best I have seen in any hostel – I got a little over excited about the spice rack. Plus the large common area makes a great place to hang out with a drink or two. The second day meant an early start to head to the Isle of Skye, where we would spend the whole day. There’s lots to see on Skye and Macbackpackers certainly make good use of the day. 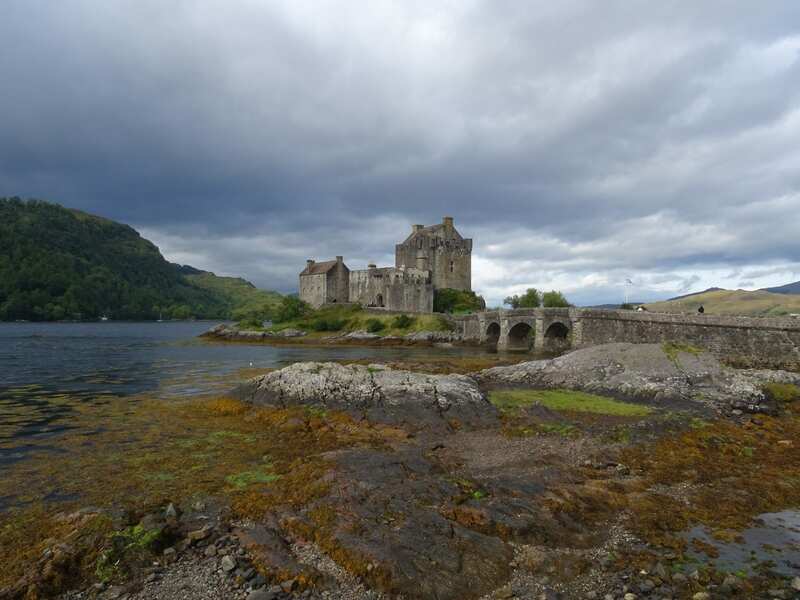 After a stop at Eilean Donan Castle, we crossed the bridge and were on the island. We had a couple of stops in the morning, then lunch in Portree. Unfortunately for us, the weather got worse and worse after Portree. Luckily, our guide knew just what to do. Stopping at Kilt Rock, he told us we should be able to hear the mermaids today. I was sceptical, but turns out he was right. The wind blowing here sounded so eerie. I’ll agree that it was the mermaids singing. Still the weather got worse. Wind and rain. Constant. It looked like it would never end. But that didn’t matter. 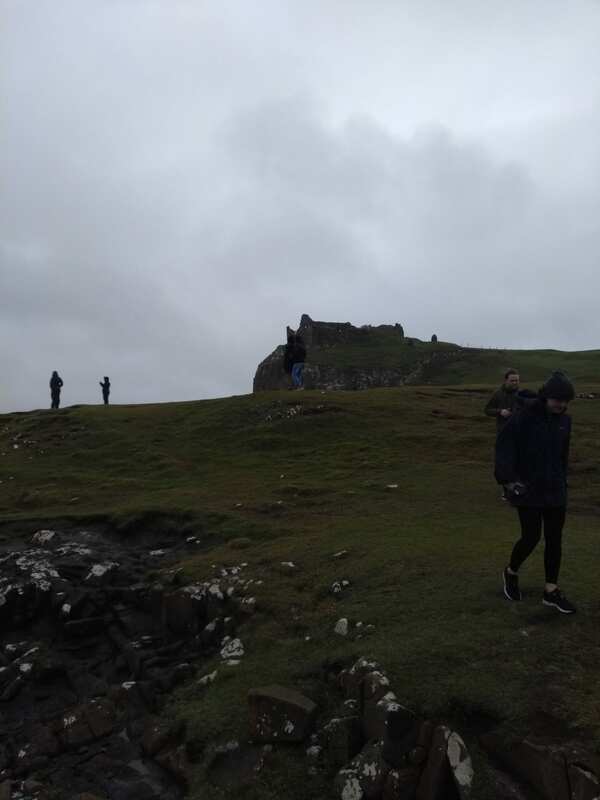 Our guide took us to Duntulm Castle, which is the most northerly point of Skye. Here we made great use of the wind. The wind blew strongly over the cliffs and if you lent into it, you wouldn’t fall. I’ve never had such fun being buffeted around by the wind. Talk about invigorating. It was definitely the best place to go in bad weather. We all followed the path to get below the castle ruins. This gave us all a small respite from the wind. Instead, the sea sprayed over the rocks and soaked us even more. It was all an incredible experience. Getting back to Edinburgh the next day meant long drives. But our guide had plenty of stories to tell us along the way. From myths and legends to true histories, he kept us entertained. Weirdly, we stopped at a huge shopping centre. I was quite a bit confused by this, until we were told of what hides behind the shopping centre. 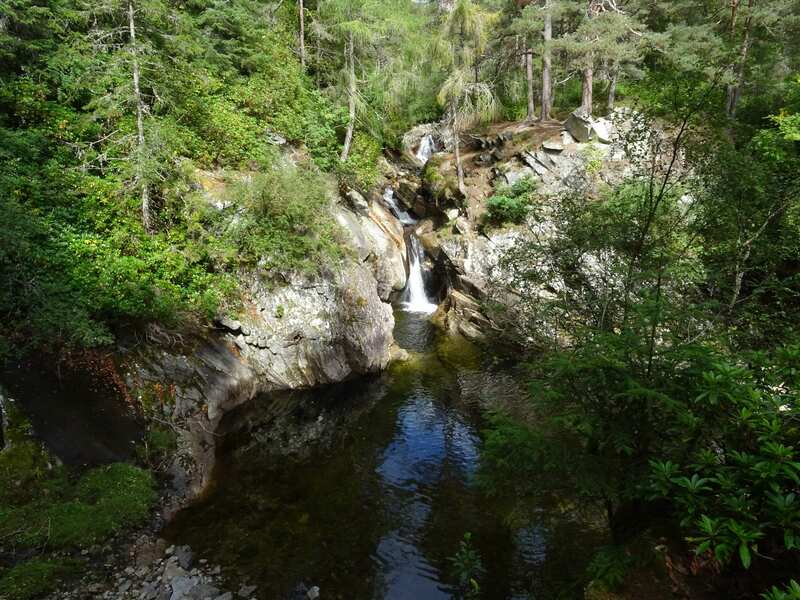 Hidden behind is a path that leads to the Falls of Bruar. 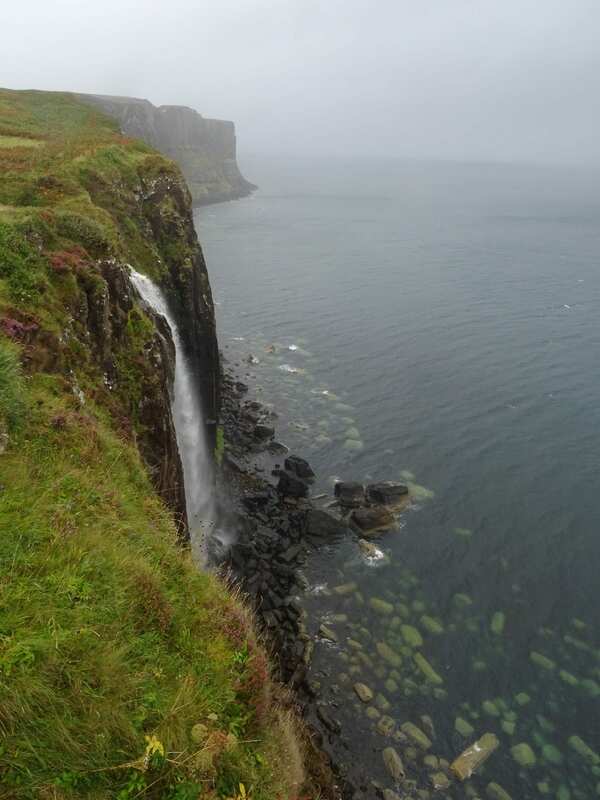 These waterfalls are so pretty that Robert Burns wrote a poem about this area. We took a circular walk that gave beautiful views of the falls. The walk also took us to the top of the falls and a bridge crossed over. Who knew a shopping centre could hide such beauty? As I love Scotland and have been here several times, I felt like I know most of the places to visit. But this trip showed me that I have more to discover here. 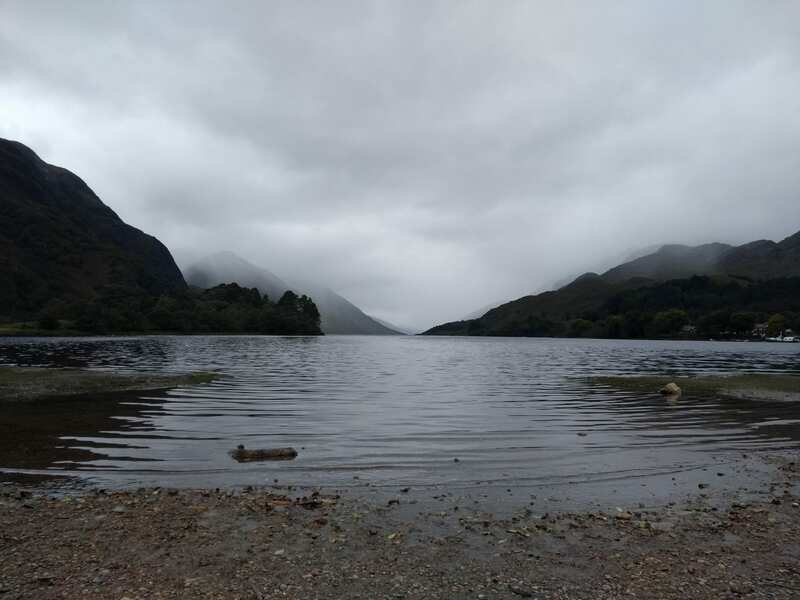 Macbackpackers (https://www.macbackpackers.com) offer a three day tour of the highland of Scotland, the Three Day Loch Ness and Skye tour (https://www.macbackpackers.com/our-tours/3-day-loch-ness-and-skye). The itinerary includes Loch Ness, Glencoe, the Isle of Skye, Eilean Donan Castle and the Glenfinnan Viaduct. The itineraries are a rough guide, and may have to change due to weather.